Golfers elbow is the overuse injury to the wrist flexor muscles. The muscles travel from the inside of the elbow leading to pain with resisted wrist flexion and resisted pronation of the forearm. The cause of the Golfers elbow is repeated wrist bending, improper lifting, throwing and swinging movements. People involved in racquet sports, using tools as screwdrivers and working on computers are usually affected. Symptoms include pain and tenderness around the inside of the elbow. They often also include pain with making a fist, stiffness of the elbow, and a weakened grip with downward movement of the forearm. Pain typically gets worse with a tight fist and picking things up with the wrist in a bent position. Check out this article for more information about Golfers elbow. The condition is usually diagnosed through special tests such as wrist flexion against resistance. Differential diagnosis from other conditions such as cervical radiculopathy, ulnar neuritis, strain of flexor-pronator muscles is usually done by the physiotherapist. Early management helps to prevent loss of grip strength and mobility of the elbow. Management includes physiotherapy treatment and in rare cases surgery depending upon the severity of the condition. Your Physiotherapist at PhysioNow will work to stretch the common flexors of the wrist, do deep friction massage to break the scar tissue, and mobilize your elbow joint or cervical spine if pain is referred from the neck. They will also plan grip strengthening exercises, do tapping and educate you regarding the precautions to help in quicker healing. This will help to prevent any recurrence of Golfer’s Elbow. 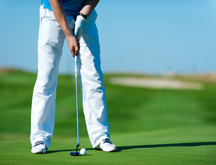 In many instances, a golfer’s elbow brace is beneficial. We carry these braces at all PhysioNow locations. Lastly, may also be beneficial as a treatment for Golfers elbow. In addition, the use of Laser therapy,application of a ‘Hawk tool’ and cupping can be used to reduce pain and promote healing. Your physiotherapist will educate you regarding these physiotherapy treatment options. So, don’t wait, book your appointment at PhysioNow today to get started on your treatment!